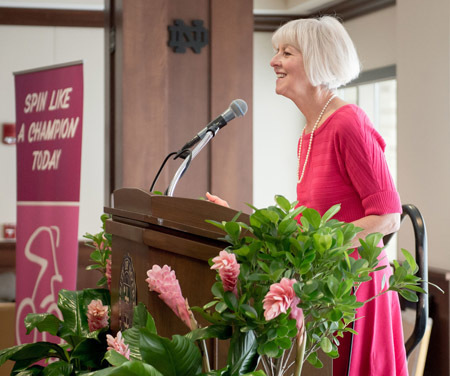 Alumna Lynn Larkin Flanagan ’75, a member of the first group of women accepted to the University of Notre Dame and a breast cancer survivor, spoke about her experience with cancer at the fifth annual Pink Zone Brunch on Feb. 1 (Sun.). Each year the brunch is hosted by the College of Science and the Notre Dame women’s basketball team to honor breast cancer researchers, clinicians, survivors, and their supporters. Flanagan stressed the importance of women taking charge of their own health decisions and being diligent about maintaining their breast health. In 1996, she went to the doctor for a routine mammogram. The results came back perfectly clear and the radiologist said she would not need another mammogram for two more years. Erring on the side of caution, she asked the nurse to do a clinical breast exam. During the exam, the nurse found two palpable masses in her left breast – neither of which had shown up on the mammogram. “If I had been doing my own my own monthly breast exam, I would have easily found them, they were that obvious,” Flanagan explained. A few weeks later, Flanagan had an ultrasound which showed that the two lumps were solid masses. She was then referred to a breast surgeon who decided to perform a fine-needle aspiration biopsy on both lumps. As Flanagan waited for the results, she did as much research as possible on the biopsy procedure. “I kept reading cancer cells could be missed if the needle did not penetrate the correct spot. I also read future cancer growth could hide in an area which was deemed benign,” she said. The lumps were removed and further testing showed that one of the lumps contained two small spots of invasive lobular carcinoma. Because of her persistence, Flanagan’s cancer was caught early. “Can you imagine if I elected to wait and monitor these two palpable masses? My treatment would have been much more extensive and my prognosis radically different,” she said. Since she had invasive breast cancer, Flanagan underwent surgery to remove two levels of lymph nodes, which all tested negative for cancer. Her treatment also included 35 radiation sessions and five years of anti-hormone therapy. She has been in remission ever since. Flanagan also discussed the importance of emotional and spiritual support during her treatments and continues to be grateful for the flow of letters, flowers, meals and prayers from her friends and family during that time in her life. The loving support of her husband Frank, also a member of the Notre Dame Class of 1975, and the humorous sentiments of her three children made her journey that much easier. Flanagan now uses her experience to educate women of all ages in the San Diego area to keep close watch on their breast health and be aware of risk factors for breast cancer, including genetic predispositions. She established a support group, Linked By Lynn, which now has over 70 members. In 2006, Lynn received the Breastlink Spirit Award and in 2008, CancerCare in New York City named her the Donor of the Year for organizing an international event on Triple Negative Breast Cancer. The brunch is one of several Pink Zone events held annually the Notre Dame. Pink Zone is a global, unified effort of the Women’s Basketball Coaches Association (WBCA) to raise awareness and support for women with breast cancer. All proceeds from Notre Dame’s Pink Zone events benefit the St. Joseph Regional Medical Center Foundation and RiverBend Cancer Services to help local women with breast cancer, as well as the national the Kay Yow Cancer Fund. Originally published by Julia Murray and Stephanie Healey at science.nd.edu on February 03, 2015.